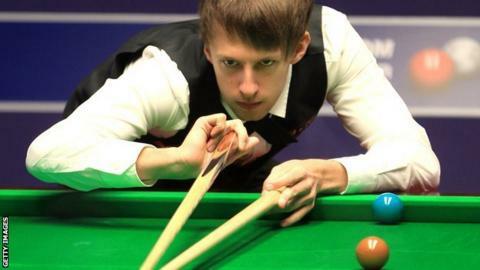 Judd Trump saw off a spirited fightback from Graeme Dott to seal a place in the semi-finals of the Shanghai Masters. The 23-year-old sped into a 4-1 lead, but Dott won three in a row, levelling with a 108 clearance, before Trump took the decider with a century of his own. Facing Trump in the last four is former world champion Mark Williams, who overcame Joe Perry 5-4. Two more former world champions, John Higgins and Shaun Murphy, complete the semi-final line-up. Higgins saw off Ali Carter 5-3, while Murphy beat Stuart Bingham 5-1. Trump, the world number two, had staged fightbacks of his own in the previous two rounds, taking five frames in succession from 3-0 down to defeat Barry Hawkins in the first round, then repeating the feat from 2-0 down to knock out Mark Allen on Thursday. The 2011 UK champion is the highest ranked player left in the draw after world number one and defending Shanghai champion Mark Selby fell 5-1 in the first round to Jamie Cope on Tuesday.